The PB22 mobile printer from Intermec secures the productivity of mobile workers with its performance. 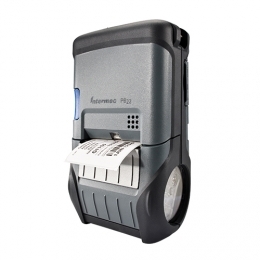 The direct thermal printer prints labels or receipts with widths between 25 and 56 mm, depending on the media you load. With up to 102 mm per second it is very fast, like hardly a comparable printer on the market. Particularly the output of the first label is extraordinarily fast. Its robust housing protects it additionally against the hazards of rough working conditions. Connect the PB22 to a mobile computer via the standard USB or serial interface. Alternately integrate wirelessly using Wi-Fi or Bluetooth optional. Media change is easily done from above, takes just a little time and increases operational time. The integrated media sensors actively support users, for a further increase in efficiency. You additionally expand the functionality of the PB22 through the flexibility of reacting to individual requirements for expandable programs and applications. Using SmartSystems the printer also allows itself to be centrally maintained.